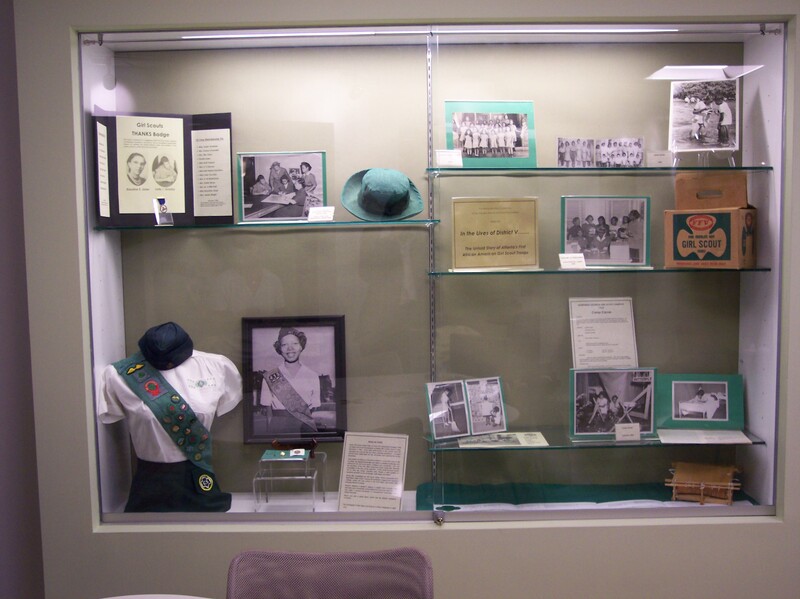 One of the perks of volunteering at the Girl Scouts of Greater Atlanta Archives is to see all the pieces of history that come in to stay. 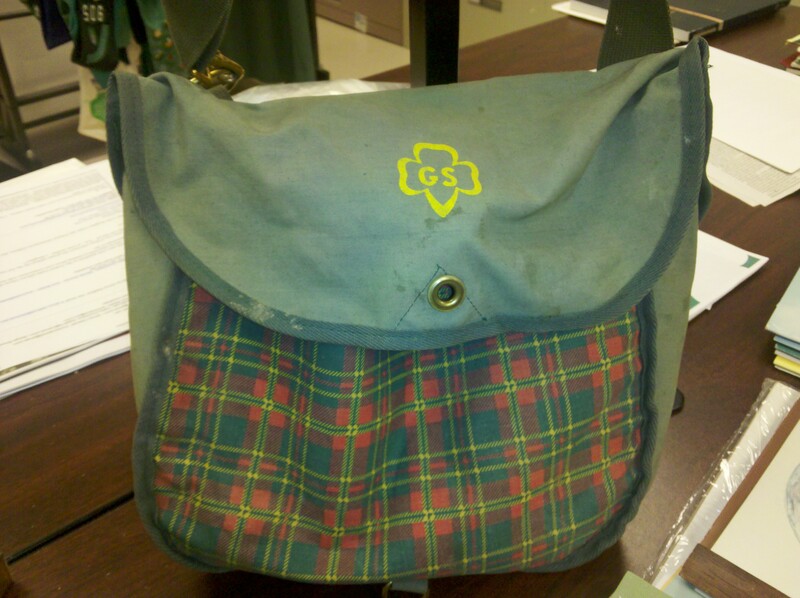 We recently received this acquisition from a former Girl Scout, and the staff were excited because we did not have this bag in our collection. We had a matching mess kit, as seen below, that was produced around the same time. You can find the plaid mess kit available online in many places, but a search for the larger matching bag is not quite as easy. 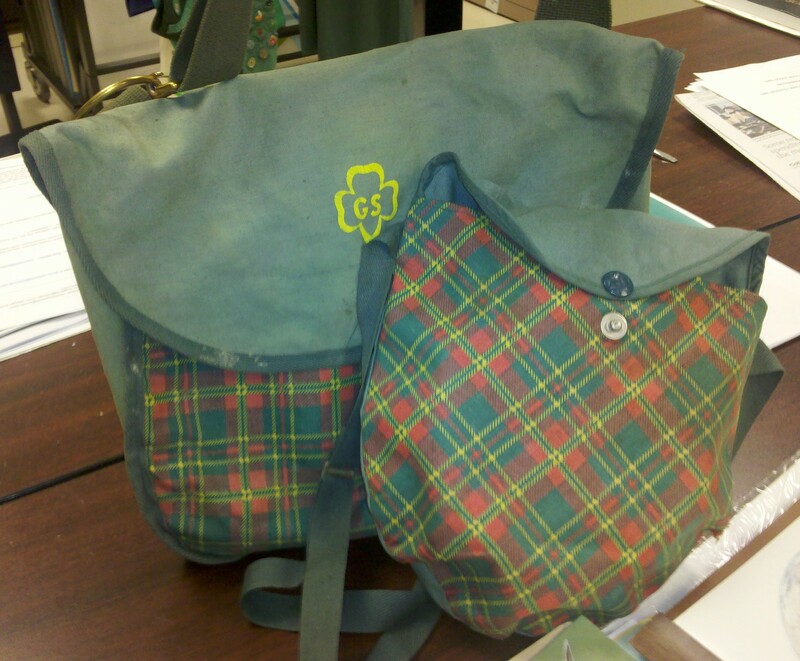 This plaid bag first appeared in the 1954 Girl Scout Equipment Catalog, and was marketed as a lunch bag. Girls would have used this at camp to carry their mess kit and canteen, or other items that might be useful. When not at camp, the Girl Scout could use it to carry her handbook and writing material. 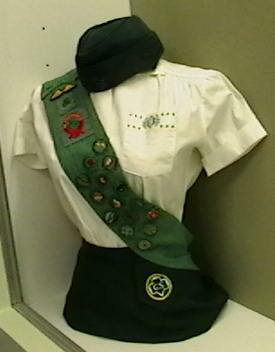 These types of bags are still popular with Girl Scouts today. In our Georgia Archives Month display, we discuss what archives are and what we do as archivists. 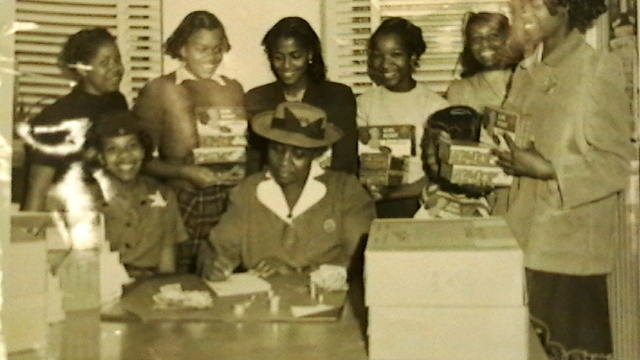 One of our core missions is to collect and preserve the history of Girl Scouting. One of the ways we accomplish this mission is by encouraging donations of uniforms, artifacts (objects), patches, sashes, pictures, or other memorabilia of scouting in the north Georgia area. These are considered accessions. This pin was given out at the August 2010 Service Unit Meetings. The oldest items in the collection are uniforms from 1915, which predate the Council’s creation by six years. However, not everything in our collection is “old stuff.” A current pin and patch will become collectors’ items in no time. Gathering history as we go is much easier than trying to track rare items down. That sweatshirt you got from a past Leader’s Weekend can become a part of a treasured textile collection. Photographs from a troop camping trip can provide researchers with a rich visual history. Learning the provenance of a particular SWAP can be fascinating. Service Unit agendas document the governance and events at the local level. This patch was given out to Girl Scouts who registered by April 2010 for the 2010-2011 Girl Scout membership year. 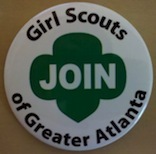 If you are a former Girl Scout, think about not only renewing your membership (only $12!) but also think about those uniforms, hats, sashes, badges, handbooks, and such that are packed away in that box in the attic. Perhaps you came across an older relative’s memorabilia and are unsure where it should go. Please contact the Archives and let us know what you have. If you grew up in another state (or anywhere in the world), we can put you in contact with your former Council.